The iconic and yet understated design of Charles and Ray Eames's Soft Pad Chairs EA 205, 207 and 208 makes them an ideal choice for prestigious meeting and conference spaces. Their luxuriant upholstery ensures soft seating comfort. With a choice of two different types of leather covers in a large selection of colours, customers can find the right version for every interior. 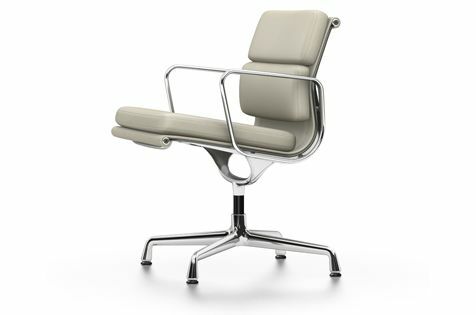 Chair with medium-high backrest. Three sewn-on cushions with polyurethane foam upholstery in Leather or Premium Leather (latter version with topstitching). Side profiles and spreaders in polished or chrome-plated die-cast aluminium. Four-star base in polished or chrome-plated die-cast aluminium. Available in two different heights.